I love Christmas. It’s always a special, almost magical time of the year. I believe the decorations people put out on their lawns spring from an expectancy that something new is about to happen. The awe and wonder of what happened in Bethlehem so long ago still awakens one’s consciousness with the promise of the miraculous. Even the anticipation of Santa arriving with gifts from afar reveal a God-shaped vacuum in the heart of man that longs for something (or someone) that exists beyond themselves. The Christmas movies today (of which the greater part center around the coming of Santa) purport a hidden message that somehow someone is going to come and make what’s wrong in the world right again. As much as I love and appreciate all the holidays, the sense of wonder seems to be unique to the Christmas season. Walking through Charlotte’s airport yesterday, we admired the huge Christmas trees donned with red and white poinsettias arranged in candy cane fashion with red and white stripes circling around the tree. Without trying to sound too theological, could there be a subtle parallel between all the festive preparations and the countdown to Christmas Day with the long-awaited centuries of the Old Testament’s promise of a Messiah finally being revealed through the ushering in of God’s son ? Back in Haiti, our singing groups and choirs are busy working on special songs for the Christmas service. I was there for most of their practices and will regret not hearing them sing. I made them promise to sing them all a second time when we return. Their sheepish smiles revealed that they were more than willing to oblige. It didn’t look like Christmas in Cap-Haitian. There were no decorations up that I could see. No drummer boys. No “Merry Christmas” greetings. No fake snow. Business seemed to be going on as usual with the everyday monotony of people trying to make a few dollars. Just the mere cashing of a check required nothing less than a miracle. The check we sent to be cashed on November 3rd has been promised to be cashed tomorrow. But “tomorrow” has become a term rather empty of meaning for us, and many other families in Haiti wait in hope that “tomorrow” really will come and they will be paid their long, overdue salaries. For them, there will not be an abundance of presents under the tree. For most Haitians, there won’t even be a tree. Yet, despite all this, the hope that I already sense here (after only having returned last night) is also there among God’s people. On Christmas Eve, they will gather together. They will sing. And they will pray. The story of Jesus’ birth will be reenacted and the Christmas story will be seen through Haitian eyes. Herod’s personal bodyguards in the annual Christmas play will resemble the infamous “Tonton Macoutes” (henchmen) of an earlier repressive regime. They will be carrying toy guns (imitations of submachine guns) as Herod barks out orders to go find this “King” and return with him. Everyone will laugh and howl for several minutes as a very pregnant Mary hobbles onstage. Something about a fellow youth member being “great with child” brings down the house every time until they can finally regain composure and continue with the skit. A baby doll with a built-in battery (representing the baby Jesus) will wail incessantly until someone will finally figure out how to turn off the battery. During the entire skit, the congregation will be laughing, talking, and making jokes while the actors, totally unfazed, proceed to the next scene. When the service ends, everyone will linger, reluctant to go back to their dark homes where there is no electricity and even less security. The same element of surprise in angels suddenly appearing to shepherds in an open field to proclaim news that Christ has been born will cause them to linger in the atmosphere of wonder. They will drain the last dregs of fellowship together, not unlike the early church, enjoying the joy and laughter that comes from the communion of the saints. Here, against the backdrop of poverty, they will savor the hope that the miracle of Christ’s birth brings. One has never truly witnessed the Christmas story until they see it through the eyes of another culture. Jesus burst onto the stage of the world and forever changed history. Whether meeting in a dilapidated building with a leaky roof and a dirt floor or in a beautiful modern building equipped with all the latest hi-tech gadgets, the common thread that binds us together as believers – HOPE – is felt especially keenly at Christmastime. My heart aches as I read and yet my heart rejoices to know that Christ is truly among them and they though poor in this world are rich in faith. I read each post tonight Dana and Prit. 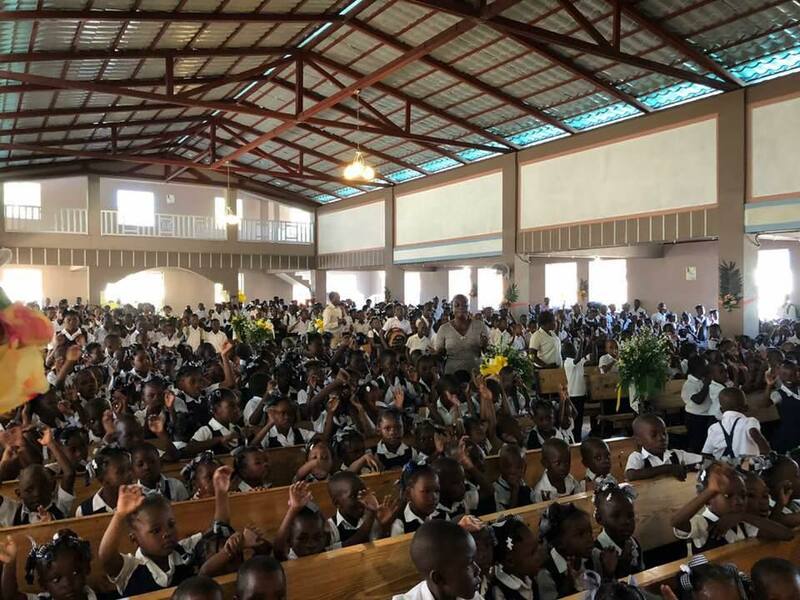 They are wonderful and in my mind’s eye I felt as if I were in Haiti, lingering with the others after the Christmas program, wanting to stay and feel hope all around me, the connection with the church family and the safety of being together. You guys amaze me and always have. You brought a piece of comfort and joy to me tonight from a difficult place and way of life. Thanks for bringing good tidings. I know that is not always possible, but with you guys, it often seems so! Hope to see you soon since you are close by. Love you!